OxiClean™ Laundry Detergent gives you a powerful everyday clean with serious stain-fighting, strength. So you enjoy vibrant colors and radiant whites, while removing even dried-on stains. Choose from Refreshing Lavender and Lily, Sparkling Fresh Scent, Free & Clear (no perfume or dyes), and convenient, single-dose paks. I tried this when it first came out and it made my clothes smell so good. It even worked own my dogs bed got all the Oder out smelled good for days. last time we brought some seems like y'all changed it up or something it don't smell as strong please if you changed the formula please put it back to old one. we loved it. Or send us some and we will buy it. Thorough cleaning with no fabric breakdown, pleasing smell. The measurable cap is a handy, time-savings feature. 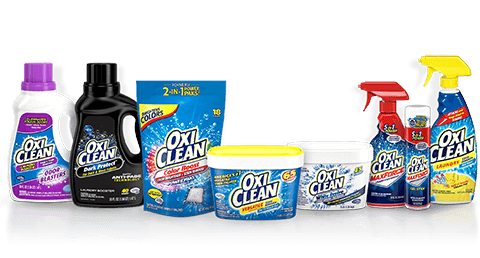 OxiClean is our new go-to laundry detergent! All the clothing came out clean, soft, and smelling great. Scraped knees, nicked chins, cut fingers—you can’t always avoid these minor injuries. And removing a blood stain from clothing, carpet or upholstery can really give you a headache. Fortunately, a simple mixture of chlorine-free OxiClean™ Versatile Stain Remover powder can eliminate stains—and worries.